This weekend I’m afraid i didn’t see the Karate Kid or Toy Story 3. Instead I saw Micmacs (trailer here), by one of my favorite director Jean-Pierre Jeunet also known for his films Amelie, City of the Lost Children, Delicatessen, Alien Resurection, and A Very long Engagement. All of his films have a lovely childlike clockwork art feel to them, which has never stopped delighting me. This one has a strong anti-weapon-manufacturer theme, a rise-in-the-gutter-rather-than-historical steampunk sensibility, and is one of my favorite con movies since Redford/Newman in The Sting. But there is little more to say. Just see it. if you don’t want to risk the $10 theater price tag and don’t know his work, rent and watch any of the others. They will equally delight. 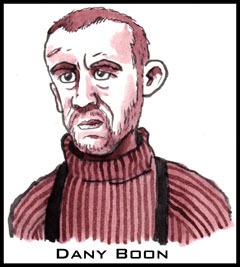 The drawing up top is of Dany Boon, who played the lead character “Bazil,” and below is a drawing of Julie Ferrier, who played the part of La Môme Caoutchouc. The re-design is coming along, as you may notice. The rest of what i intend to do is mostly cosmetic, so if you have any further suggestions, let me know. I am loving this comic. For some reason the colour palette reminds me of the computer games I played in the late ’80s and early ’90s. I love the character of Emily, and that the ethnicity of the human characters is reflected in the style of drawing (their faces don’t appear to be drawn from the same template). Or at least that’s my interpretation – I may be over thinking it. Agreed. Absolutely wonderful director. He has a magic touch. @Crow. Totally. The first I saw was City.O.T.L.C. and was blown away, and have enjoyed every one since. I already like the new site design! It’s easier to read and navigate. Once again Nogg gets to inform someone’s kin (presumably) about their death. Let’s hope he doesn’t make a habit of it. Uh Oh. We’ll hope Pierrot doesn’t know what said sandwiches look like.